As members of the Army Navy Air Force, we hold the sacred trust of ensuring the tradition of remembrance is observed by Canadians every year at the 11th hour on the 11th day of the 11th month. This tradition dates back to the First World War when the guns fell silent, marking the end of military conflict and the Remembrance of those who would never return home. The National Poppy and Remembrance Campaign raise funds for veterans and their families, the new military and others who are disadvantaged. 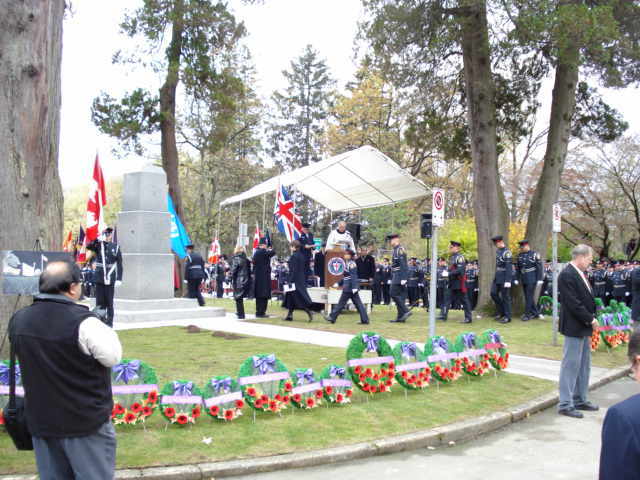 Attend a Remembrance Day Ceremony. Make a donation to help local Veterans in need. The Poppy Campaign commences the last Friday in October and continues to the end of the day November 11th, Remembrance Day. ANAF Branches throughout BC & across Canada organize the annual Poppy Campaign in their respective areas. All donations are in turn redirected to support programs and services for veterans and their families. The 2018 Poppy campaign was an awesome success with our unit raising over $20,826.33 towards the Vancouver Poppy Fund Campaign. Many thanks go to our poppy chairperson, Jan Holt as well as our taggers, Ella and Sandi Kanciruk from Unit ANAF #26 and Agnes Keegan from Legion Branch #179. Once again these ladies stepped up and did an excellent job this year tagging at our downtown locations. Thanks also goes to Bobbi and Ken Cameron and Leslie Leoppky for their work behind the scenes. Looking forward to 2019. The 2017 Poppy campaign was a great success with our unit raising over $14,000 towards the Vancouver Poppy Fund Campaign. Many thanks go to our poppy chairperson, Jan Holt as well as our taggers, Ella and Sandi Kanciruk from Unit ANAF #26, Kay Grieves from Legion Branch #30 and 96 year old Agnes Keegan from Legion Branch #177. Once again these ladies stepped up and did an excellent job this year tagging at our downtown locations. We hope to do it again in 2018. The 2016 Poppy campaign was a great success with our unit raising over $16,000 towards the Vancouver Poppy Fund Campaign. Many thanks go to our poppy chairperson, Jan Holt as well as our taggers, Ella and Sandi Kanciruk from Unit ANAF #26, Kay Grieves from Legion Branch #30 and 96 year old Agnes Keegan from Legion Branch #177. They did an excellent job again this year tagging at our downtown locations. We hope to do it again in 2017. The 2015 Poppy campaign was a great success with our unit raising over $18,000 towards the Vancouver Poppy Fund Campaign. Many thanks go to our poppy chairperson, Jan Holt as well as our taggers, Ellen, Sandy, Bobbi, Kay and Agnes for a great effort this year. This year’s total was close to the 2104 total and we hope to do it again in 2016. 2014 Poppy campaign was a great success with our unit raising over $19,000 towards the Vancouver Poppy Fund Campaign. Many thanks go to our poppy chairperson, Jan Holt as well as our taggers, Ellen and Sandy for a great effort this year. This year’s total was $2000 above last year’s total and we hope to do it again in 2015.